In butterfly photography, one has to look for both the big and small butterflies to fully appreciate their beauty and diversity. Whilst it is easy to spot the larger and more showy and colourful butterflies, many small butterflies often escape the notice of the casual observer. There are a number of butterfly species that have wingspans of 10-30mm. They also fly fast and erratically, and are not easy to spot, much less photograph! In macrophotography, the beauty of a very small butterfly can be brought to larger-than-life details that our eyes do not normally see when in the field. 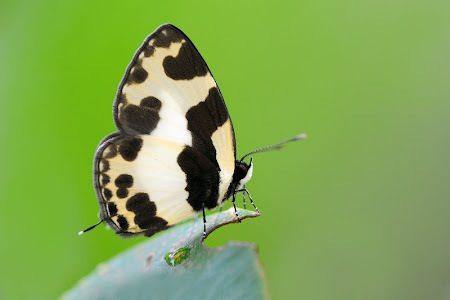 One such butterfly is the diminutive Elbowed Pierrot. A black-and-white butterfly with thin, thread-like tails, it only has a wingspan no more than 30mm. ButterflyCircle member Anthony Wong shot a close-up of this small butterfly perched at the edge of a leaf at Dairy Farm Nature Park last weekend.